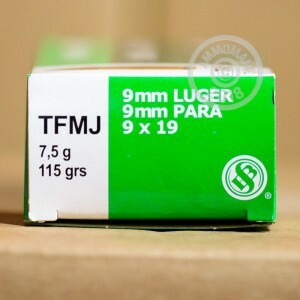 This non-toxic 9mm ammunition is a great choice for any target shooting, but provides the most benefit to indoor shooters who often face facilities with sub-optimal ventilation. This ammo uses encapsulated total metal jacket (TMJ) bullets and lead-free primers to keep its user safe from airborne lead particles. Each cartridge in this box of 50 fires a 115 grain projectile at a muzzle velocity of about 1,300 feet per second. While this ammo is not formally designated +P, it is a bit "hotter" than most range loads and will work well as a stand-in for more expensive high pressure defensive hollow points. 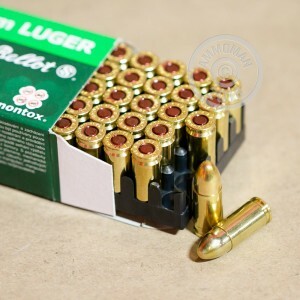 Sellier & Bellot ammunition is loaded in the Czech Republic using reloadable brass cases and Boxer primers.